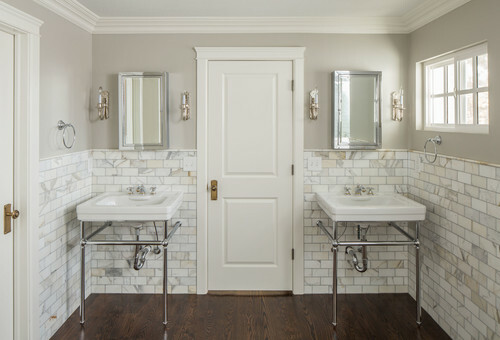 Gray is anything but bland - it continues to shine as a popular choice in interiors, from interior walls to cabinets and veining in marble choices. The Blue Door Painting design team expects this trend and its “greige” color cousin to stick around. Thinking about updating your interior with some trendy neutrals? 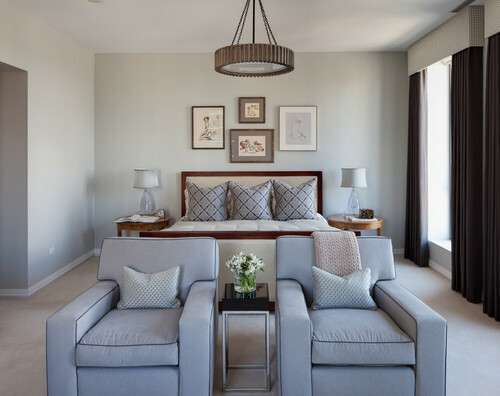 Check out some of our favorite grey and “greige” options, as well as some beige wall colors that combine beautifully with gray decor elements. This Sherwin Williams shade is the perfect gray base with warm undertones. It immediately creates a comfortable and warm feeling of home. There’s nothing flat or dull about this gray! Scared gray walls may be too overwhelming? Consider this soft-as-a-cloud option. It features cooler tones and is gentle on the eyes. The adaptable shade is approachable and picks up the tone from the surrounding environment. Not for faint hearted, Timber Wolf by Benjamin Moore is a bold saturated color that provides drama without draining the light from the room. Embrace the gray and make a daring statement with this moody and deep color. Bonus: It plays well with gold touches. This versatile and warm gray is in the same family as Repose Gray. This shade is a perfect neutral that works beautifully with any color combinations because it has enough coolness to transition. Mindful is not only great for walls, but makes for a classy cabinet color. Names can be deceiving - this color is actually part of the Benjamin Moore Off-White collection. It’s a subtle nuance off-white with just enough gray to make our top five. Classic Gray walls create a tranquil and serene environment, so this is the perfect base to create a restful space. Our new Top Five series will join our Job of the Month series as a regular facet of the Blue Door Painting blog. It is brought to you by Blue Door Painting’s design partner, Jasmin Reese Interiors. Looking for design ideas or color inspo? Contact Jasmin and her team for an unparalleled professional opinion. If you’ve already found your perfect gray and want to get started, contact us today for a FREE estimate so we can help you create the home of your dreams. Follow us on Instagram for daily inspirations and read our 5 STAR reviews on Yelp, Angie’s List or Houzz.